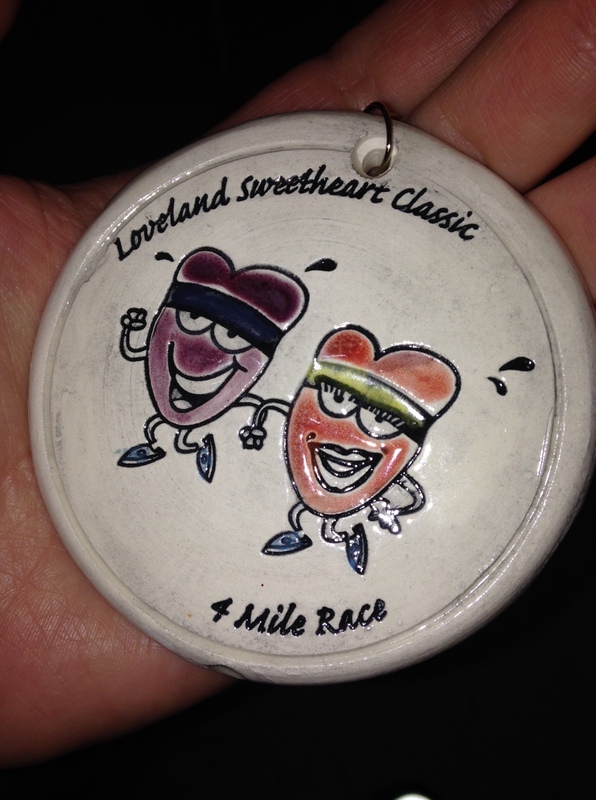 On Saturday, I ran the Loveland Sweetheart Classic 4-Mile Race. Going in, I wasn’t really sure what to expect. I’ve just recently started doing speedwork again, and I didn’t know how the course conditions would be, either. All of last week was frigid — as in, barely above zero — so when I saw that the temperature at start time was 20 degrees and it was sunny, I got pretty excited. The race started at 10, and we got there around 9. The start and finish were at a high school, which was nice because we got to stay inside and keep warm until start time. At about 9:30, I did a two-mile warm-up and hit the bathroom, and then it was go time. We lined up, shivered through the National Anthem, and took off. At the starting line. Brrrrr. 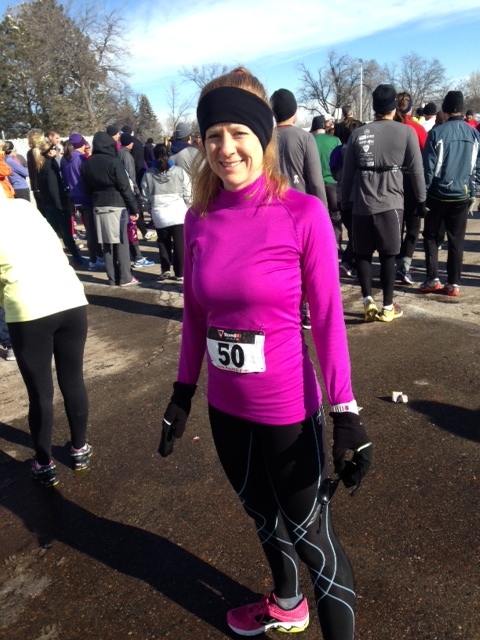 I had only a vague plan and goal, as I knew my performance would be largely dependent on how much ice was on the course. I planned to start with a 6:30 mile and pick it up if possible — ideally, each mile faster than the last. Mile 1 ticked by, right on pace: 6:29. Mile 2 was a smidge downhill, with a tailwind, and not much ice: 6:20. And then, mile 3 came along, with a lot of ice. Mile 3 was along the lake, and the wind over the water (ice) was chilly and in my face. Though my effort stayed pretty even, I ticked off mile 3 in 6:41. Mile 4 was even worse. 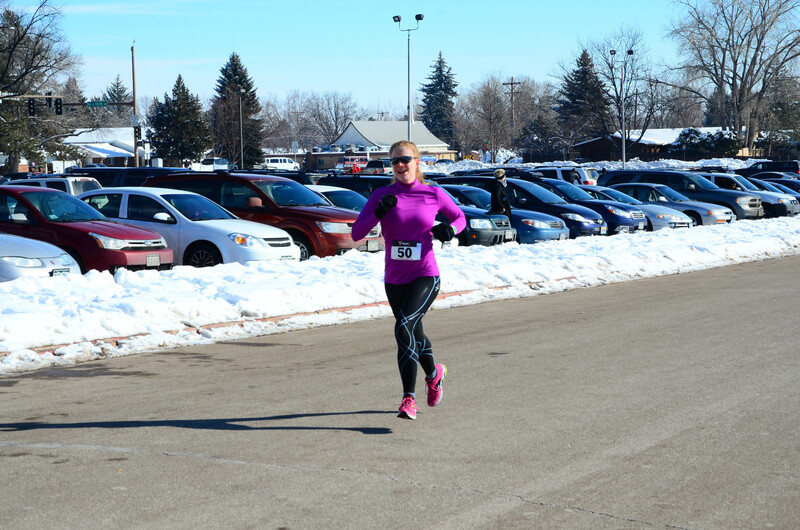 The course is pretty flat, but most of mile 4 was a slight uphill with a number of icy patches. 6:45 was my pace there. Photo copyright John C. Giroux. He gave each runner up to three complimentary images. That’s pretty cool. So those are some silly splits, but I don’t feel too bad about them, as their unevenness was due more to conditions than poor pacing on my part (though I probably should have eased up on mile 2). 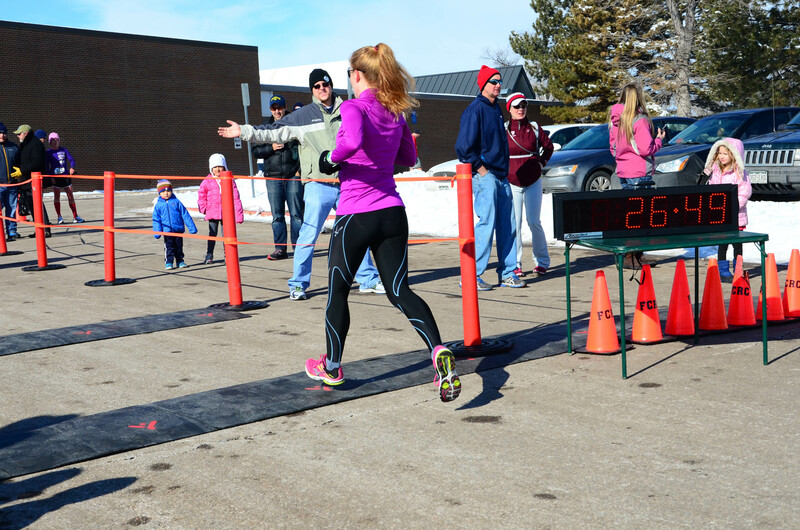 I crossed the line in 26:49 — good enough for second female and first in my age group. Photo copyright John Giroux. My favorite part of this picture is Jordan in the background. The first woman and I compared notes after the race. Both our Garmins registered 4.1 miles, but we agreed that it was probably more that we were dodging ice than that the race was long. Overall, I was happy with my performance — it was right where I expected to be, given the shape I’m in and the course conditions. I really enjoyed this race and definitely recommend it. I’ve done it before, at its old location, and I liked this location (through neighborhoods and around the lake) much more. The race had some minor organizational snafus, but nothing major. It’s not a huge race (519 runners this year), and all the profits go to local high school cross country teams, so I’m willing to overlook those minor issues. Right after the race, still trying to breathe. Also, the age group award medals were adorable, and they came with a $25 gift certificate to Runner’s Roost. Sweet. I’m excited now to see what my time will be for my goal 10k in a few weeks. Hopefully a few solid weeks of speedwork (and less snow and ice, fingers crossed) will make for a great race! 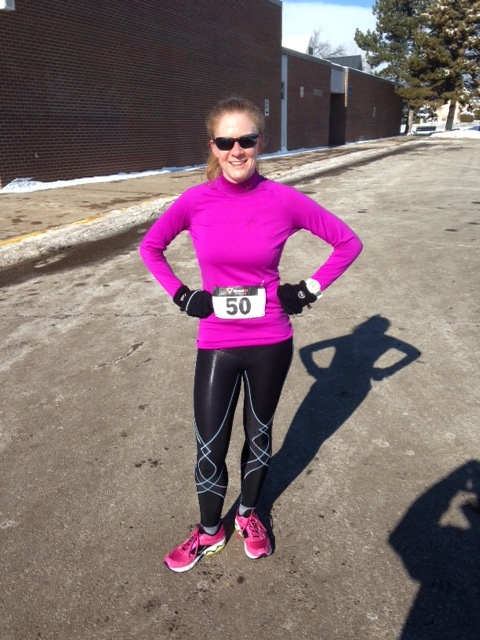 Previous PostTraining For A Quick 10k: Week 2Next PostThinking Out Loud. Because I’m Trendy. It’s supposed to be in the 50s again by the weekend! Woot woot! You’re so speedy! Way to go! You are so fast!! Sounds like a good race. I can’t wait to see how your 10k goes as well. Nice splits! And Congrats on 2nd place! You seriously rock – 4 miles in 26 minutes?!?!!? SWEET!!!!!!!!!! !